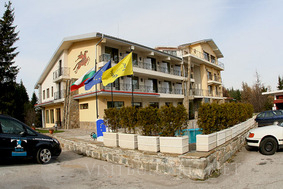 Location: Hotel Via Trayana is located in Beklemeto ski area, 18 km from Troyan at about 1300 metres above the sea level and in very close vicinity to the ski tracks. Accommodation: The hotel offers 10 standard rooms, 9 comfort rooms and 6 apartments. Each room is equipped with satellite TV, direct telephone line, hairdryer, bath-tub, Internet and balcony. Wine & Dine: The restaurant has 100 seating capacity and offers great variety of specialties from the traditional Bulgarian cuisine upto all culinary world standards. The summer garden has 50 seating capacity and offers barbeque and rakia tasting. Via Trayana has spa & relax centre with massage, sauna, steam bath and jacuzzi. The hotel also disposes of heated outside swimming pool. The conference centre offers one conference hall with 50 seating capacity and screen, flipchart, wireless Internet and multimedia.